One of my favorite things about playing games is that they give us a wonderful way to create our own stories. While you can get good anecdotes out of just about any game, some titles lend themselves to the story-telling process better than others. At the top of this list are the sandboxes -- games that provide players with a framework to manufacture their own worlds, then get out of the way. These games hold a special place in my heart; growing up, my brother Ryan and I would play 2nd Edition Dungeons & Dragons on a regular basis with our friends. Ryan's gnome wizard persona, Locke Vanthor, lives on to this day in many pencil-and-paper games we play. I tracked down a description of his D&D character from about 15 years ago for our Origin Stories article back in August. A lot of it still holds true; who wouldn't want to be a crazed gnome wizard who loves fireballs? In more recent history, we've looked at titles like Ben Robbins' Microscope and Ross Cowman's Fall of Magic that strip out all but the most necessary "gamey" elements in pursuit of crafting a story. They're definitely not for everyone, since they require a lot of participation from everyone at the table, but are absolutely worth trying if you're looking for something different. Fiasco, a storytelling game about small-time capers gone horribly wrong, is also excellent if you'd like something a bit more structured! I'd be remiss talking about games and storytelling if I didn't mention one board game that the Irregulars have been playing: Rob Daviau's SeaFall. In SeaFall, each player is the ruler of a province that has set out to explore a vast ocean. Along the way, you'll be naming your provinces, sailing the sea in search of islands, treasure, and trade, and generally having a grand time putting stickers all over your board. By the end of a campaign, you have an entire board covered in stories. That shipwreck over there? That's where Dana was the first person to sink another player's ship. The slew of atolls all grouped together? Just the luck of the draw from the event deck! That island covered in enmity stickers? You can thank countless raids from Wartopia. Why is one of the provinces named Candy Mountain? You'll have to ask Katt. When I think of video games that accomplish a similar feat, Minecraft is the first game that comes to mind. It's gone from a barebones alpha title to a worldwide phenomenon in just a few short years, and much of its success comes from giving its players a set of tools, then getting out of their way. It's accessible to kids and adults, and being available on just about every platform out there certainly hasn't hurt. 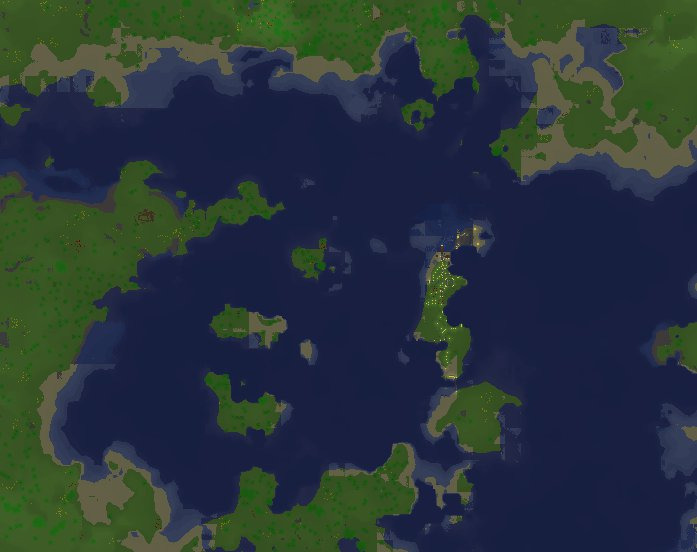 My very first Minecraft world. We've come a long way since 2010. The hour is late! Next time, we continue the storytelling conversation with a look at IO Interactive's brilliant assassination sandbox HITMAN.